Chambers received All-American recognition as a senior at Eastern Kentucky, where he led the team in tackles and assists in three straight seasons. 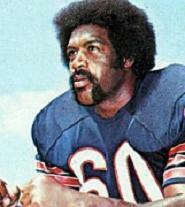 Chosen in the first round of the 1973 NFL draft (eighth overall) by the Bears, he moved directly into the starting lineup. Bears went 3-11 to finish fourth in the NFC Central as the defense ranked 17th overall and tied for 12th with 32 sacks. Chambers followed up his outstanding rookie season by receiving second-team All-NFL recognition from UPI and the Associated Press and first-team All-NFC honors from AP and The Sporting News in 1974. While he was not named to the Pro Bowl in ’74, he was in 1975 and ’76 and was a consensus first-team All-Pro in 1976, his peak season. However, a major knee injury limited Chambers to four games in 1977 and contract issues caused him to be traded to the Tampa Bay Buccaneers for 1978. Injuries and illness hampered him in his first season with the Bucs but, moved to right end opposite Lee Roy Selmon, Chambers again became a big-play lineman in a 1979 season in which defense carried the team all the way to the NFC Championship game, after which he retired. Overall, he was named to the Pro Bowl three times in seven years, but injuries cut short a career that began with great promise.